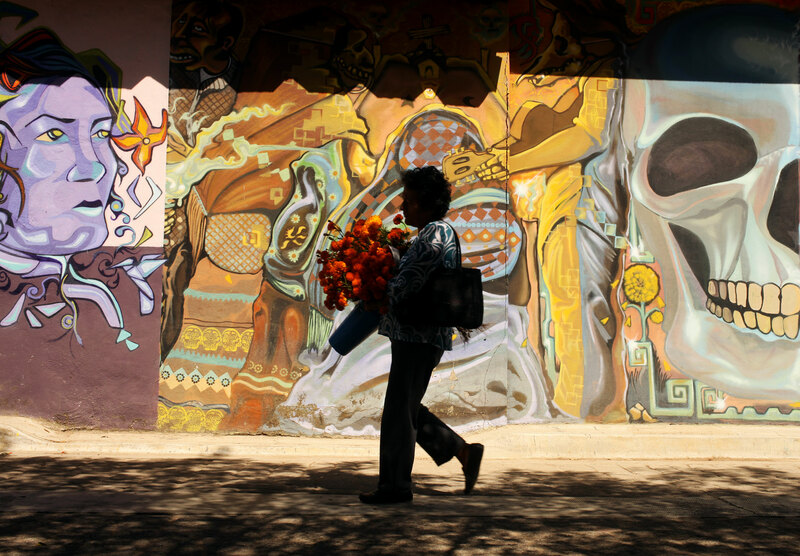 Oaxaca is a fantastic city. It’s known for so much I might pity its advertisers when they need to select what to highlight for the city and state. Do you gush and rave about the food? The diversity of languages and cultures? The handicrafts? The scenery? The architecture? In the months leading up to October 31st, November 1st and November 2nd most of the hype seems to be about the Dia De los Muertos celebrations that the city and surrounding areas immerse themselves in. 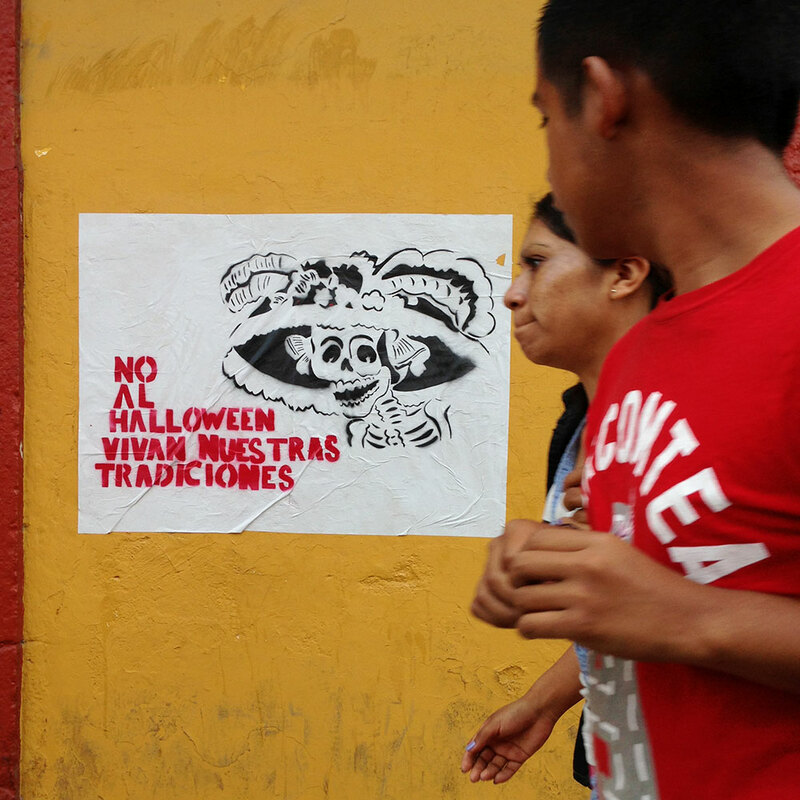 But, I’ve noticed a shift in the atmosphere in the three years since I last visited Oaxaca for Day of the Dead. More tourists and more Halloween. But as awareness of Day of the Dead spreads through the United States and beyond I believe we are going to see more and more candy corn and Jack-o-Lanterns creeping into the holiday. I’m not directly irritated by Dia De Los Muertos celebrations spreading in the United States, but it has the affect of getting tourists to throw down their plastic and crowd cemeteries as REAL people try and observe traditions their family has more or less followed longer than they’ve been speaking spanish. Day of the dead is something even the Spaniards couldn’t destroy but how will it fare against Disney? As I feel my anger building on the subject I have one memory playing over and over in my mind. 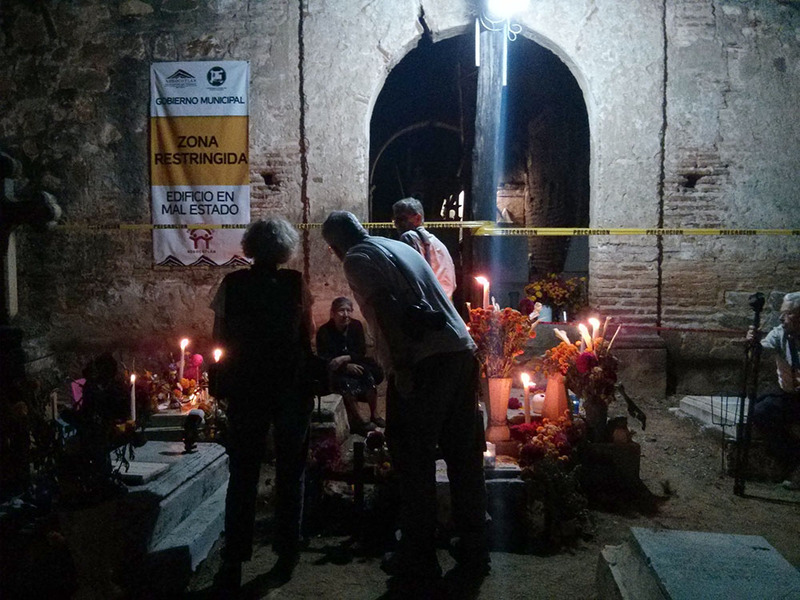 A little old woman hunched over in the Xoxocotlan cemetery surrounded by a half dozen people popping flashes at her. One woman (who told Nathaniel she was a hobbyist being escorted through the Dia De Los Muertos festivities by a National Geographic photographer) had a remote flash that she worked that little old woman over with for at least 30 minutes. And I don’t mean one shot every few minutes – I mean celebrity style motordrive shooting at times. At one point she even placed the flash on the grave the woman was mourning over. I asked the woman’s family member (I assume daughter) if the photographer had asked to take her photo and she said no. I asked her if the old woman was bothered by it and she said yes and explained that was why the woman had stood up and turned away from the cameras for a while. I offered to intervene for them because the photographer didn’t speak spanish but she said it was okay and thanked me anyway. We stood and watched horrified by it… we think she was with a Photo Xpeditions Tour . The hobbyist photographer was certainly more aggressive than most but at times it seemed there were more tourists and TV crews present than locals. I might be a hypocrite for allocating so much space to complain about the effects of tourism when I myself am a tourist. But, I think people need to use more common sense when they try and absorb the traditions of other countries. How would that photographer feel if someone she didn’t know accosted her the same way? Someone she couldn’t talk to and was maybe a little afraid of? Every photo you see in this blog post of someone in a cemetery I either had a very lengthy conversation with (see photo at the top of the post) or a short exchange with to assess wether or not they were okay with my camera and I being present (see photo below). Our first day out for Dia De Los Muertos Nathaniel and I went to three different cemeteries – one of which was during the day for both of us and another I visited during the day alone and took Nathaniel back to later at night. 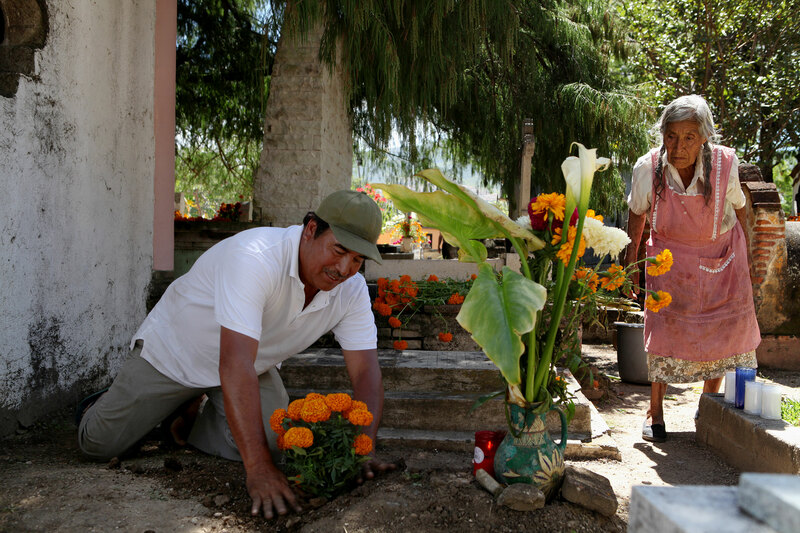 For me – the sweetest memory so far has been standing in the cemetery of Tule with Martin Santiago Lopez and his mother and learning from them about their town’s history and the people they loved that are now buried there. I was hesitant to speak to them at first, but when I saw them openly engaging with some other daytime visitors I approached to strike up a conversation. They were incredibly welcoming to me (and my camera) and told Nathaniel and I to come back to Tule today (Saturday) for their town’s big party in the afternoon, which we intend to do. The photos do not have the soft romantic glow of like the other images I took later in the night but they are authentic images of wonderful people freely giving permission to be photographed by the only camera in the cemetery, which to me is more ideal than candles and a solitary figure hunched over hoping I will go away. The second night we decided to take a tour and see if it was surprisingly insightful or as terrible as we feared, but Nathaniel will tell you more about that tomorrow. Another great article. Keep it going. 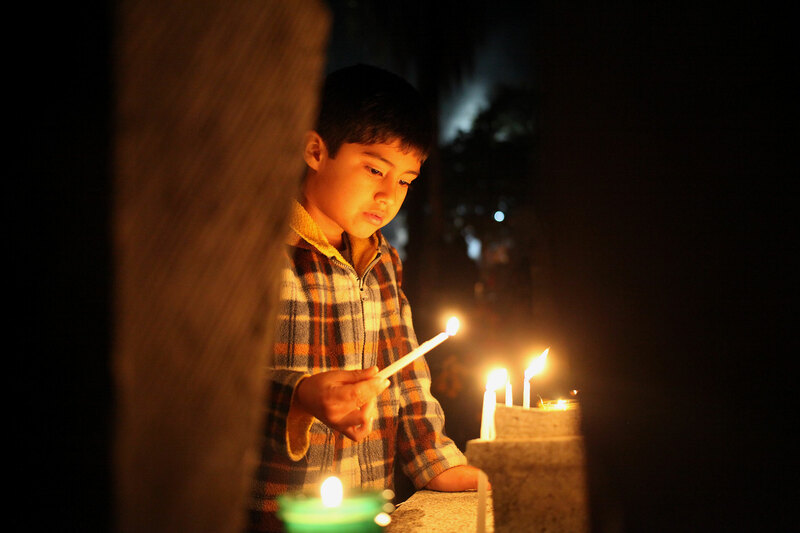 The photograph of the young boy holding the candle makes you want to know what is going through his mind. The facial expression and his gaze do not give any clues and leaves it to my imagination , great photo Alex! Thanks Waba! I hadn’t thought about how Dia De Los Muertos creeping into global pop-culture can also keep young Hispanics interested in honoring the tradition… And I’m glad to report most tourists seemed respectful – but we Americans already have a pretty terrible image when it comes to our manners in other countries… Tonight I want to try and focus my photos on the changes global influences are bringing to Dia De Los Muertos. Your blog is very cool. Great photography as well. Friend of Nathaniel’s father. I do remember you from the ACS days, even though I was very young. My dad told me he sent you the blog, glad your following along on the adventure! As always you capture the true character and emotion in the expressions of those you photograph. Thanks for the updates. You guys are living the Dream… I’m certainly Jealous of your journeys, and wish the best of travels to you both. I’m so glad that my bike went to such a loving owner, and that your mindset is allowing you to make the most out of your experiences! I’ll follow each post with bated breath! Glad to hear your enjoying the blog and thanks for being such a good previous owner. I am learning lots from the bike, following in your foot steps.